This article was originally published by the Stockholm International Peace Research Institute (SIPRI) on 29 August 2016. Myth has it that Prometheus stole fire from the Gods and brought it down from Mount Olympus to Earth for the betterment of humankind. Another, more deadly type of fire was brought to the world on 16 July 1945 when the first nuclear explosive device was detonated at the Alamogordo Test Range in the desert of New Mexico, USA. In the intervening seven decades, nine different States have carried out over 2000 nuclear explosions, polluting the world’s oceans, atmosphere and land with devastating health effects on many millions of people and the environment. Suffering from the radiological effects on human health and the environment, Kazakhstan took the initiative in promoting the adoption of 29 August as the International Day Against Nuclear Tests by the United Nations General Assembly on 2 December 2009 through Resolution 64/35. It marks the day on which President Nursultan Nazarbayev of Kazakhstan finally closed down the Semipalatinsk nuclear test site on 29 August 1991, signaling that nuclear explosions would never again resonate against the Degelen mountains and in the plains of Central Asia. The Soviet Union carried out 456 nuclear explosions at the Semipalatinsk Polygon nuclear test site in Kazakhstan between 1949 and 1989, leading to lasting major genetic damage to the nearby population and contaminating thousands of hectares of land rendering it unusable for generations. Of the 2,061 nuclear tests conducted by nine States, 530 were detonated in the atmosphere resulting in the release of large quantities of radioactive materials, such as Iodine-131, Cesium-137 and Strontium-90. According to the Vienna-based Comprehensive Nuclear-Test-Ban Treaty Organization (CTBTO), atmospheric nuclear testing equaled 29,600 Hiroshima bombs, or two Hiroshima bomb detonations every day for 35 years. Prohibiting nuclear tests was brought on to the international arms control agenda in 1954, but it took until 1963 and a close escape from nuclear war between the USA and the USSR during the October 1962 Cuban missile crisis to agree to the 1963 Partial Test-Ban Treaty (PTBT) that banned nuclear explosions in the atmosphere, oceans, space and on land. 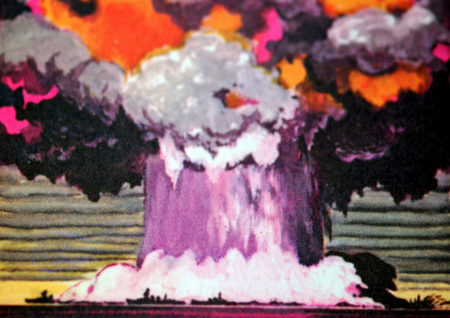 Given the Cold War madness of the Mutual Assured Destruction (MAD) military strategy, the nuclear-weapon States did not want to prohibit underground nuclear explosions. It took another 33 years before agreement was reached on the Comprehensive Nuclear-Test-Ban Treaty (CTBT) in 1996 to outlaw all nuclear explosions in all environments forever. Unfortunately, permanently ending nuclear testing remains unfinished business as the CTBT has not yet entered into force. After opening for signature on 24 September 1996, the CTBT has been signed by 183 and ratified by 164 States. For entry-into-force, 44 specific States have to sign and ratify the CTBT, but 8 of these are still defying the international community: India, Pakistan and North Korea have not even signed the CTBT; China, Egypt, Iran and Israel have signed but not ratified; and the US Senate rejected ratification in 1999. India has consistently opposed the CTBT since 1996, even though it was an Indian prime minister who first proposed a nuclear test ban in 1954. Pakistan has always supported the CTBT but it will not sign unless India does. Likewise, Egypt and Israel are locked in deadlock, although the CTBTO is optimistic about Israel’s ratification. Reportedly China will ratify only after the USA has done so and it is concerned about the conditions that the US Senate may attach to US ratification. Opposing then-president Bill Clinton, the US Senate rejected ratification of the CTBT in 1999 amid concerns about verification. The Republican-controlled US Senate is opposed to the CTBT mainly on ideological grounds and the Obama administration rightly does not want to bring the treaty up for ratification again unless it is assured of a positive result. Reportedly the Obama administration is proposing a UN Security Council resolution reaffirming global commitment to a world without nuclear testing. A complete ban on nuclear testing would extinguish the nuclear fire of Prometheus. However, the world will need to strive to eliminate its legacy of more than 15,000 nuclear weapons and nearly 2,000 tonnes of weapon-usable nuclear materials. Tariq Rauf is the Director of the Disarmament, Arms Control and Non-Proliferation Programme.